2) Cibernético, Damián 666, Halloween b Blue Demon Jr., Máscara Sagrada Jr., Tinieblas Jr.
Super Muneco attacked his mini afterthe match. V3 cracked Perro Aguayo with a beer bottle. Perro Jr. returned to make the save. *1/4, treated as a title change, but neither really held belt. -*1/4, 10:34. Sirenita beat Shitara. Don Juan (Shitara's second) attacked Sirenita. Pierroth ran down as if he was going to make the save, but also attacked Sirenita. *, 23:30, Tecnicos took 2/3. Thunderbird almost knocked himsef out on a SSP, and Halloween laid down so Thunderbird could beat him. Challenges and a psuedo singles match followed. unclear of the actual finish, but it ended with 10 people beating Rey Misterio Jr. (including Heavy Metal doing the surprise save and then turning on Misterio anwayy.) Konnan tried to make the save but was beat up. Octagon finally ran people off. Each man put their car on the line. Pierroth and Mosco de La Merced attacked the referee and then Misterioso. Killer came out to join them, but then swerved and attacked the rudos, unmasked to reveal he was Konnan. Konnan revived the referee and Rey got the win. Psicosis, Mosco and Tirantes all stopped Konnan from touching the final corner. 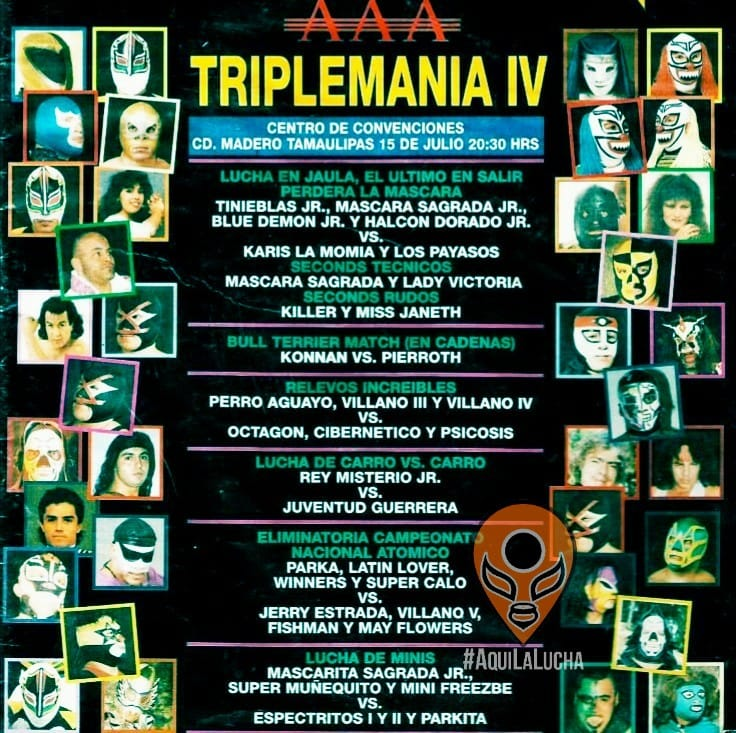 2) Bala de Plata, Caballero De Plata I, Caballero De Plata II vs Escriba, Gran Jefe II, Gran Jefe Jr.
5) Atlanic Jr., Caballero Halcón, La Amenaza vs Halcón Blanco, Junior Halcón, Stuka Jr.
5) Halcón Dorado Jr., Killer, Pierroth b Konnan, Máscara Sagrada (Mendoza), Rey Misterio Jr.